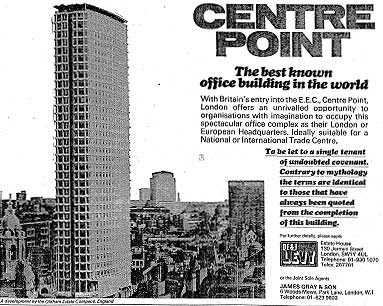 Lambeth Cyclists architecture ride this Saturday: 26 November 2011: Richard Seifert: The Marmite of Architecture? This Saturday's Lambeth Cyclists' architecture ride will look at the work of Richard Seifert. Our relationship with post-war architecture is a love-hate affair at best; but nothing generates more mixed responses than the work of Richard Seifert and Partners, creators of of Centre Point, the Natwest Tower, Euston Plaza and other questionable icons of commercial modernism. Dismissed by some as gross vulgarians, lauded by others as pioneers of pop architecture, Seiferts were by any estimation among the most successful firms of the 60s, 70s and 80s, precursors of such contemporary behemoths as Foster & Partners and Rogers Stirk Harbour. With much of their output now disappearing or under threat, it's more than time for a reassessment - so leave your preconceptions at home and take an unprejudiced look at the Seifert legacy. You don't have to like it! All welcome - no need to register - make sure your bike is roadworthy - bring lights! 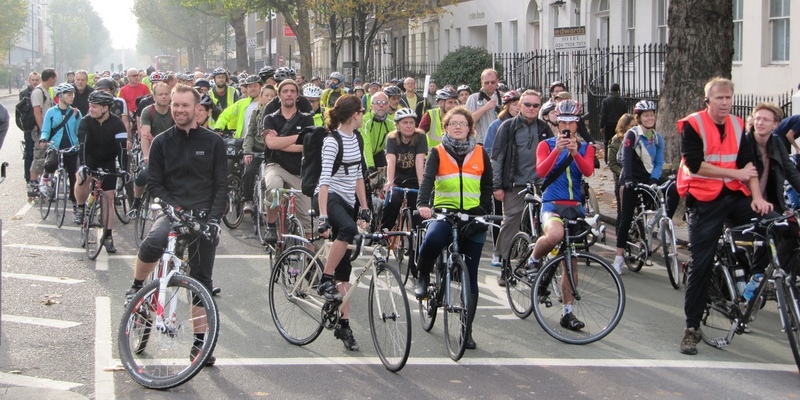 At the start of November up to 1,000 cyclists, (pictured)including an MP and London Assembly members set off from Lambeth on a tour of the worst 10 collision hot spots in London. Dubbed the Tour du Danger the riders assembled opposite Oval tube station and undertook a trip around all the junctions observing the road layout and marking a very public protest. Supported by London Cycling Campaign and Lambeth Cyclists the tour highlighted the strength of feeling around this issue – future rides are planned in the run up to the Mayoral elections in May. Starts 10.30am from St Mark's Church opposite Oval tube station. See today's Evening Standard and Kennington People on Bikes blog and a previous post on Lambethcyclists.org.uk for more information. Three of the top 10 most dangerous places for cycle collisions in London are located in Lambeth, new figures have shown. 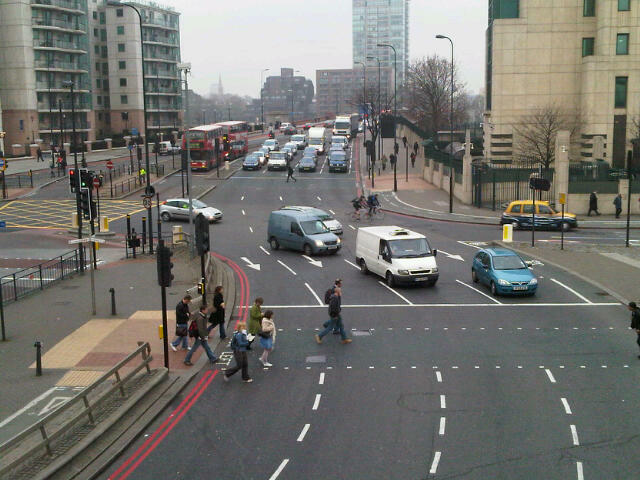 In reply to a question from Lambeth and Southwark London Assembly Member Valerie Shawcross Boris Johnson, the Mayor of London, has released a top 10 list of the worst locations for collisions between cyclists and motorists across the capital. All three of these locations have been the scene of collisions between cyclists and motor vehicles. All three are major routes in to, and out of, central London for cyclists, pedestrians and bus users commuting in from Lambeth and other boroughs. It is not however inevitable that such roads will result in more cyclist collisions – the multi-lane design of these junctions makes them unsafe for cyclists and pedestrians. The design of Vauxhall Cross in particular (pictured) is dangerous– up to five lanes of speeding one way traffic do not make a cycle or people friendly junction! 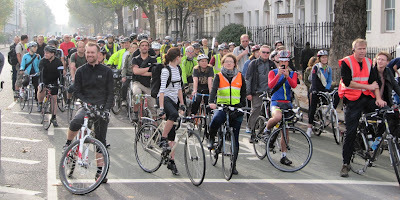 Lambeth Cyclists will be joining with other London Cycling Campaign borough groups from across London on a tour of the cycle collisions top 10 locations on Saturday 12 November 2011. Join us on this ride – meet 10:30am at St Mark’s Church, opposite Oval tube station. Led by bloggers Cyclists in the City and ibikelondon and marshalled and insured by London Cycling Campaign we will be attempting to look at ways in which these junctions can be improved to prevent collisions and make them more friendly. To help you stay visible London Cycling Campaign is offering a FREE set of bike lights worth £24 if you JOIN by Wednesday 9 November 2011. • Great deals on theft insurance - LCC Urban Cycling Insurance policy offers excellent theft and damage cover for your bicycle at a very competitive rate, with great benefits including 'get you home' cover. • Enjoy up to 15% off new bikes, accessories, parts and servicing in over 120 London bike shops can save you a fortune, and can cover your whole membership cost. • LCC members also receive exclusive offers from Cotswold Outdoor, H2 gyms in Soho and many many more. Please note that all offers and discounts are made to members entirely at the discretion of the third-party supplier, from which we do not gain or have any control. This Sunday, 6 November 2011, Southwark Cyclists and Lewisham Cyclists will be following the veteran cars as they travel from London to Brighton. The cycle ride to the coast will start in Lambeth - meet 7:15am at Lambeth North tube station, SE1 before speeding on down to Croydon to meet others at 8:15 at East Croydon station. The ride will then proceed to Brighton in the traffic with the veteran cars. Further information on the ride can be found on the Southwark Cyclists website. Dave Hill in the Guardian has written an analysis of the Mayor of London Boris Johnson's cycling policies.